When I went down to Kathy's for her mini convention, she showed me how to make the paper cups that were demonstrated at convention. 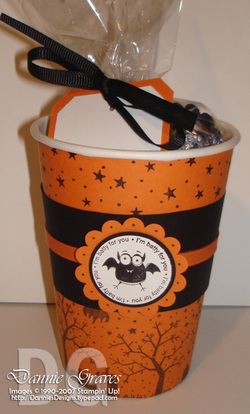 I wanted to make a Halloween gift for my children's teachers, so I thought I'd give the cups a try. 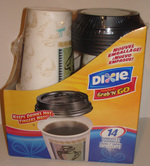 I used the Dixie Grab 'N Go 12 oz cups. Here's a picture so you'll recognize them in the store. I've seen them in Wal-mart as well as Target. To get the pattern for these cups, you have to take one apart and trace it onto chipboard. 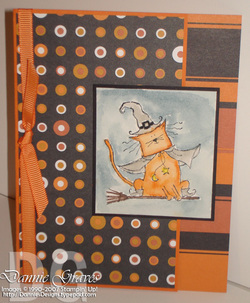 I used my Spooky Skyline wheel across the bottom and the star stamp from Background Basics across the top of my Pumpkin Pie card stock. 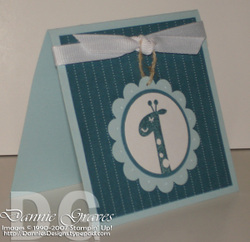 For the tag I rolled my Happy Jacks wheel across white card stock and used my Tag Corner Punch on the top corners. Then I layered it on Pumpkin Pie card stock. I filled the cello bag with chocolate. 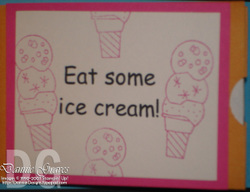 As I promised yesterday, here is my tutorial for the teacher gift certificate book. Step 1: Cut the open flap off your coin envelopes. Open the flap and make sure it is sticking out to the right side. 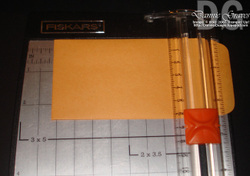 Place it on your paper cutter and line up the bottom of your envelope (the sealed edge) at 4 1/8" and cut. 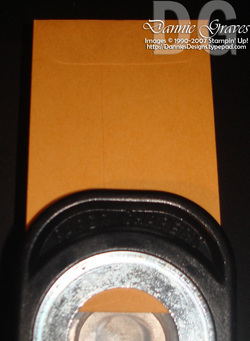 Step 2: Take the 1 3/8" circle punch and punch out a little notch on the open side of your envelope. Be sure it is centered left to right on your envelope. The notch makes it easier to get the gift certificates in and out of the envelopes. 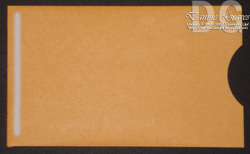 Take your punched envelope and lay it on top of the next envelope. 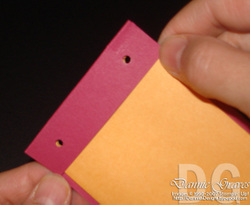 Using the first envelope as your guide, punch a hole in the second envelope so that they both line up. Continue punching notches in the rest of your envelopes. 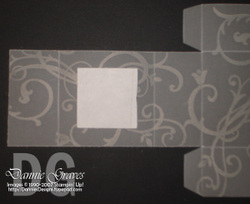 Step 3: Put adhesive down the left side of your envelope (the gray line in the photo) and stick another envelope on top. Continue the process until all of your envelopes are glued together. Set them aside. Step 4: Cut a piece of card stock 9 3/8" x 2 3/4". With the 9 3/8" side going across the top, score your card stock at 3 3/4", 4", 8 3/8" and 8 5/8". Fold on all of the score lines. Step 5: Take your stack of envelopes and put adhesive on the back going down the left side. Using the photo below as a guide, glue them to your card stock. 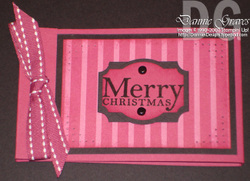 Step 6: Fold your card stock on the left side so that it wraps up and around the envelopes. Take your crop-a-dial and using the smallest hole punch, punch a hole 1/2" up from the bottom. Be sure to center the hole from left to right as well. Step 7: Repeat the process at the top so that you have two holes punched. Step 8: Thread the ribbon through the holes and tie it in a bow. Step 9: Now comes the fun part, decorating the envelopes. I used Basic Black (3 1/2" x 2 1/2") and Holiday Harmony DSP (3 1/4" x 2 1/4"). Take the extra envelope that you punched and place your card stock on the right side of the envelope so you're covering up the notch. Yes, part of the envelope is showing. Don't worry. 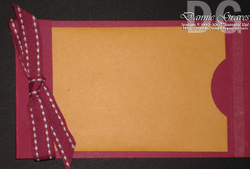 When you glue this into your booklet, you won't see it because the ends of the envelope are covered by the piece of card stock with the ribbon tied through it. 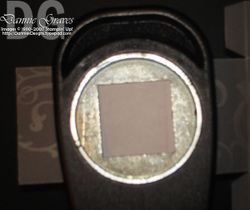 Step 10: Using the notch as your guide, punch a hole through your card stock and DSP. 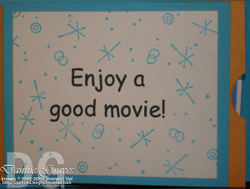 Step 11: Decorate your card stock however you'd like. Then glue it on your first envelope in your booklet. See, the envelope doesn't show! I pierced the paper in all 4 corners. I also sponged around the edges of the DSP with Purely Pomegranate ink. I printed the words on my computer and then cut them out and punched them with the ticket corner punch. I also sponged the edges of the Purely Pomegranate paper with Purely Pomegranate ink. Repeat this process until all of your envelopes are decorated. 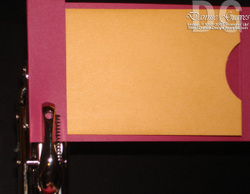 Step 12: Close the booklet by taking the right flap and tucking it under the card stock with the ribbon tied through it. Now it's time to decorate the cover. I decorated the cover just like my pages--sponging around the DSP, pierced holes in all 4 corners, even the dimensions of the black card stock and DSP are the same. 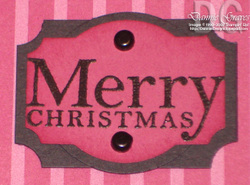 For the center image, I used the Merry Christmas stamp from the All Holidays stamp set and embossed it with black embossing powder. I punched it out with the Designer Label punch and sponged the edges with Purely Pomegranate ink. Next I punched out a black circle using the 1 3/8" circle punch. I glued that on the back of the "Merry Christmas" piece. Last I cut out a piece of black card stock that measured 1 3/4" x 1 1/4". I punched all four corners using the ticket corner punch and glued this on the back of the black circle. Now it's your turn! I'd love to see what you make using this tutorial. Upload your pictures to your blog or to SplitCoast and leave a comment on this post so others can see the booklets you've made too. Have fun! At the end of each school year I try to give my children's teachers a gift to thank them for all they've done. For this past school year I decided to make a little booklet full of gift certificates that the teachers could use over the summer. I went and bought five different gift certificates (most of them just $5 a piece) from stores here in town. Here's the booklet I made to hold the gift certificates. I personalized each booklet with the teacher's name. If I had had more time I would have added some layers and decorated the front a little better, but I was making these the night before school let out. I wasn't able to come up with a gift idea and the day before school let out my friend shared this fantastic idea with me. Talk about cutting it close! Here's the first page with a gift certificate to Barnes and Noble. This gift certificate was to Baskin-Robbins. This gift certificate was to Blockbuster. This gift certificate was to Trader Joe's. This gift certificate was to Bath and Body Works. 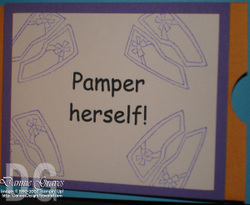 I did make two of these for male teachers so instead of it saying "pamper herself," I changed it to "pamper his wife." I thought the box would be perfect for wedding favors. 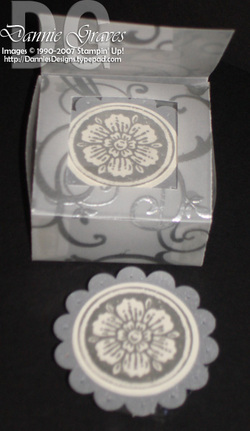 I used the swirl from Baroque Motifs and embossed it in Silver embossing powder on Vellum card stock. Here's the box with the lid open. It has an acetate window so you can see what's inside. I filled the box with peppermint patties because the wrappers were silver and would match the silver embossing. 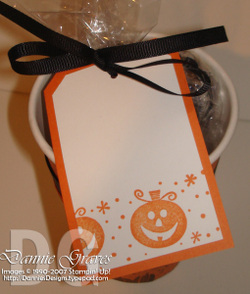 I used my Carte Postale set to decorate the candy. When you download the pattern, it is true to size. 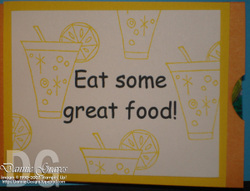 You can print it on your card stock and just cut on the solid lines. However, this won't work for vellum. The printed black lines would show through the other side. To get around this, I measured the pattern with a ruler and cut and scored it according to the pattern. NOTE: I cut and scored the box first, then I flipped it over and embossed on the opposite side. When you punch out the 1 1/4" square for the window, you'll want to be sure it's centered. Take a scrap piece of paper and punch out a 1 1/4" square. Put adhesive on that square and stick it on the vellum right where you want the window to be. Turn your punch upside down and line it up right over the white square and punch! It's the easiest way I've found to get a nice, centered window. While blog browsing, I came across the idea of using our Scallop Circle Punch to decorate peppermint patties. I thought the idea looked fun and I put it on my list of ideas to try sometime. Then I went to Safeway and found bags of pink "support breast cancer research" peppermint patties. How could I pass up the chance to try something fun while supporting such a great cause? Covering the patties was simple. I found the perfect size ribbon stamp to use in the retired set "Godspeed." 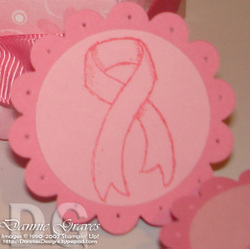 I stamped the ribbon in Regal Rose ink on Pretty in Pink card stock and punched it out with my 1 3/8" circle punch. I finished off the design by using my paper piercing tool to pierce each of the scallops. The box came together quickly as well. I used an 8" x 8" piece of Flowers for You DSP to make the box. 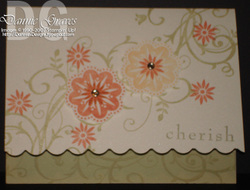 The handle is a piece of Regal Rose card stock cut to 3/4" x 8". I then layered another piece of matching DSP on top that measures 5/8" x 8". The handle is held on by silver brads which I covered with ribbon. 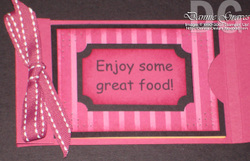 It's a very simple layout that would work with a variety of stamps. 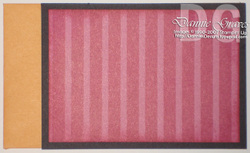 I wanted to make an elegant card, so I used my Holiday Harmony DSP and my Purely Pomegranate Satin Ribbon. You can't go wrong using them together. I inked up the saying with my versamark pad and embossed it with black embossing powder. I also used my paper piercing tool in the upper right and lower right corners. Remember, there's only about a month left to order from the Holiday Mini Catalog. If you'd like to purchase the Holiday Harmony DSP and Purely Pomegranate Satin Ribbon, contact me today! First, I want to say thank you to all of you who are visiting my blog. I've only had my blog for 3 weeks now and I've already had almost 2500 hits. I've enjoyed reading your comments and emails encouraging me to keep going. Thank you so much. Second, I've got another card to show you. Last week was surgery week in my family. Both my mother and my brother-in-law had surgery two days apart. I wanted to have a little fun with my brother-in-law's get well card, so I went with a Halloween stamp set and one of the sketch challenges on SplitCoast. I decided to use the cat from the Haunting Halloween stamp set. I stamped him in black Stazon and watercolored him. This is only my second time watercoloring and I'm pleased with how it turned out. For the inside of the card I stamped "Witching you..." (from the same stamp set) and finished it with "a quick and speedy recovery." I hope he likes the card. We have some friends who recently had their fourth boy. I love my boys dearly, I'm just not sure I could handle four of them! I needed a card to go along with the gift, so I got out my brand new Wild About You stamp set. I think this set is perfect for baby cards. I used my paper piercing tool to make holes around the scallops. Then I threaded linen thread on my needle from the Crafters' Tool Kit and went right through one of the pierced holes. I was afraid it would make the hole too big, but it worked great. I love the size of these little cards when I need to put together a quick card. 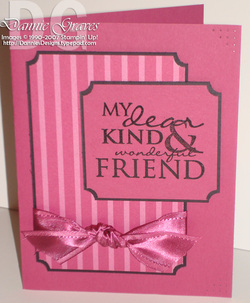 I love to recognize my downline with a hand-stamped card or gift when they have a fantastic month of sales. This month I needed a little inspiration and Kathy came to the rescue again. Kathy shared with me a card that she found on Debbie Olsen's blog. Isn't this gorgeous? 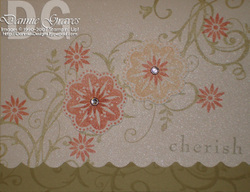 I added some rhinestone brads from the Pretties kit to add a little bling to the shimmer. What an awesome card Debbie! I wasn't able to go to Stampin' Up! 's convention this year, but my friend Kathy went. Being the sweetheart that she is, Kathy invited me to come to her house and attend her mini-convention. I was able to see all her swaps, make all the convention make-n-takes, and try out some of the new techniques from the convention classes. I had six kid-free hours of stamping. It was so nice. 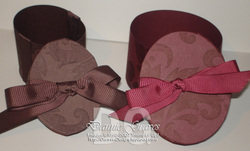 One of my favorite projects that we made that day were these oval boxes. Aren't they elegant? They're so much prettier in real life. These boxes would be great for wrapping small gifts for Christmas. You could also use them as a jewelry box or fill them with chocolate. Edited to Add: Click here to see a video tutorial on how to make these boxes. I know lots of you are going to ask for the pattern, but you may already have it. 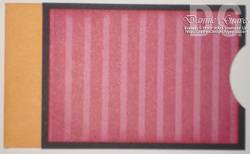 The pattern was posted on the Stampin' Up! website (along with several other main stage projects) as a bonus for those who attended convention. Thank you Kathy for sharing it with me!